I love this recipe because its not only for Pesach, but it can be made year round! There’s no ingredient inside that you would need to change or omit for Pesach which is great! This recipe is so easy to make and the pizza always come out delicious! It’s naturally gluten free and the crust is made up of just the cauliflower itself! 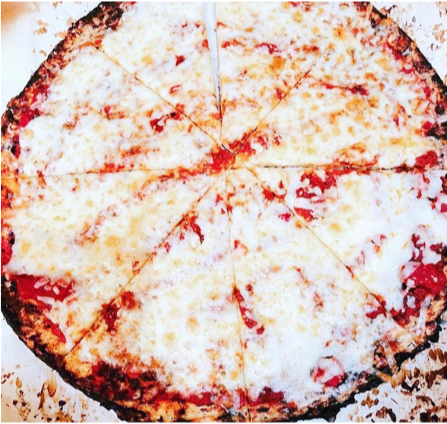 Hand a slice to your kid telling them it’s pizza ( leaving out the cauliflower part) I can guarantee they will eat the whole slice and ask for more! Place into a 450 degree oven for 30-40 minutes, the crust should turn almost black (please don't skip this step and make sure crust is well cooked. Should basically be fully cooked. Once crust is fully cooked place desired sauce and cheese on top, pop back into oven until the texture of melted cheese you like. Let cool a little before slicing. If you're able to hold the pizza in one hand you've achieved the perfect cauliflower pizza and trust me it's so so good! YUM!